(NY Times) --- The Justice Department has opened an investigation into the fatal shooting last month of an unarmed black Florida teenager by a crime watch volunteer, a case that has set off a national outcry. In a statement released Monday night, the Justice Department said its Civil Rights Division, in conjunction with the Federal Bureau of Investigation, would investigate the death of the teenager, Trayvon Martin, who was shot as he was walking to the home of his father’s girlfriend from a convenience store in Sanford, just north of Orlando, on Feb. 26. The neighborhood watch volunteer has told the police that he shot Trayvon, 17, in self-defense. The Justice Department said it was also dispatching members of its Community Relations Service to Sanford to try to defuse tensions. The Rev. Al Sharpton is scheduled to attend a town-hall-style meeting in Sanford on Tuesday evening. The announcement of the federal investigation came after protests and a growing number of complaints that the Sanford Police Department had mishandled the case and that the federal government needed to open its own inquiry. The shooting occurred on a rainy night as George Zimmerman, 28, was patrolling his neighborhood in his sport utility vehicle. Several break-ins had been reported in the area in recent weeks, and Mr. Zimmerman was especially alert. The 911 calls from a gated community in Sanford, north of Orlando, culminate with a faint voice in the distance crying and pleading for help. A gunshot is heard, and then silence. Mr. Zimmerman told the police that he had shot Trayvon in self-defense, after the two got into a fight and Mr. Zimmerman wound up on the ground. The next spate of calls came from anxious neighbors. A faint cry for help and terrified howls can be heard in the background. Neighbors said they had seen two men nearby in the dark. They reported hearing a gunshot. It is not clear from the audio whether one or two shots was fired. And, with the voice muffled in the distance, it is difficult to know which of the two men is crying out for help. The police told The Orlando Sentinel on Friday that they believed the voice crying for help was Mr. Zimmerman’s. They say that prosecutors have told them they do not have enough evidence to dispute Mr. Zimmerman’s claim that he acted in self-defense. Florida affords people who act in self-defense greater protection than most states, allowing them to take action if they have a reasonable fear that their lives are in peril. The case was turned over to the state attorney’s office last week. Sergeant Morgenstern said that Mr. Zimmerman was in contact with the police and was cooperating with the investigation. In a letter to The Orlando Sentinel last week, Mr. Zimmerman’s father said that his son had black relatives and friends and was not the aggressor in the case. Mr. Zimmerman, who is studying criminal justice, was arrested once in 2005 on charges of battery on a police officer and resisting arrest with violence. The charges were dropped. Trayvon had no criminal record. He was suspended from his Miami high school for 10 days in February, which is the reason he was visiting his father. The family said the suspension was not for violent or criminal behavior but for a violation of school policy. 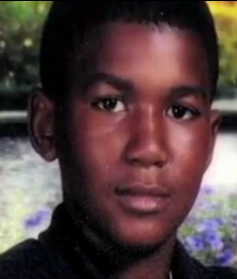 Trayvon’s parents say they have no doubt that it is their son’s voice pleading for his life in the background. They say they can imagine Trayvon reacting with fright or concern upon seeing a burly stranger trailing him in his car, then getting out to follow him.